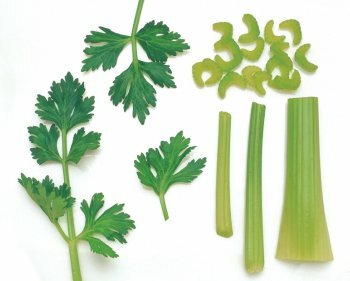 How do you think of celery? a. It's the crunchy stuff in a tuna salad. b. It's something dieters eat to take their minds off the fact that they can't have pizza. c. It's just a crispy container for scooping up dip. If you answered yes to any of the above, think again. Celery is more than just a tasty and filling snack; it's an amazingly versatile ingredient that's good raw or cooked, and adds to all kinds of dishes. It's also a low-calorie, high fiber dietary powerhouse that's packed with beneficial nutrients. Celery has been shown to lower blood pressure, neutralize stomach acid, reduce inflammation, and act as a natural laxative. Some people even consider it to be mildly aphrodisiac. How's that's for a reason to crunch a stalk or two? The Apium graveolens or celery plant has been a dietary staple all over the world for millennia; celery leaves were found in the tomb of Tutankhamen, and it is repeatedly mentioned in ancient Greek literature. Its medicinal use is documented as far back as the year 30 AD, when it was listed as a component of a pill intended for pain relief. Celery grows readily in temperate climates and is an economical use of planting space, as virtually the entire plant is edible. In addition to the celery stalks, the root is sold as celeriac and even the seeds are used for adding potent flavor to soups, stews, and other cooked foods. Celery is an excellent source of a number of vitamins and minerals. The leaves are high in vitamin A, and the stalks deliver vitamins B1, B2, B6 and C. Celery is also a good source of calcium, iron, potassium, magnesium, phosphorus, and sodium. While some of the health claims for celery are less fact than folklore - for example, the idea that it functions as an aphrodisiac is scientifically unfounded - others have been proven by research. - A University of Chicago study showed that celery lowers blood pressure because it contains a compound called Phthalide, which dilates blood vessels. - Celery's diuretic properties can be traced to its combination of sodium and potassium. - The high fiber content of celery makes it a valuable aid in weight reduction because it creates a feeling of fullness without adding extra calories, and the high fiber content also makes it an effective natural laxative. - Celery seeds contain high levels of calcium, which contributes to overall health in a variety of ways ranging from bone strength to mental clarity and immune support. There are CoQ10 Benefits for women at all stages of life. Find out more at CoQ10 Answers.